Throughout our daily routines, we rarely take pause to appreciate the magic behind municipal water and wastewater systems. These systems treat and deliver clean drinking water directly to our faucets. They also take and treat the wastewater that goes down our toilets and sinks. The infrastructure behind the magic is buried beneath our yards and streetscapes—often out of sight and out of mind. Yet municipal water systems across Canada face some pretty significant challenges. 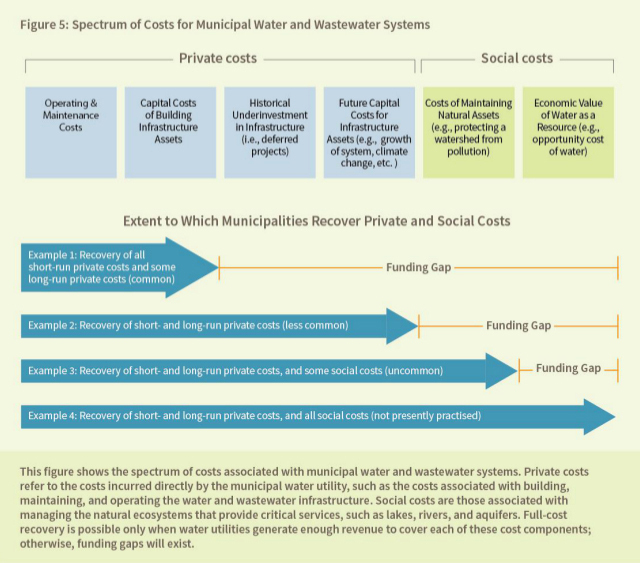 The Ecofiscal Commission’s tackled these issues in a report released last fall: Only the Pipes Should be Hidden: Best practices for pricing and improving municipal water and wastewater services. The main take away: well-designed user fees can encourage conservation, fund infrastructure, and protect our water quality. We have a municipal water issue? When it comes to the economics of municipal water and wastewater—and how we pay for the infrastructure that provides these services—Canadian municipalities have made considerable progress. Increasingly, Canadian municipalities are relying on user fees to finance their systems. User fees (i.e., paid water rates through monthly or quarterly bills) create a price signal that helps drive conservation and provides revenue to ensure that water and wastewater systems are kept in a state of good repair. Despite this steady progress, however, Canadian municipal water systems face significant challenges. The prices Canadians pay for water and wastewater services are some of the lowest in the world and typically do not reflect the full costs of building and operating them. Further, the costs of building and maintaining the necessary infrastructure are increasing. And many municipalities have aging infrastructure that require significant investments in the coming decades—both to deal with new issues arising from climate change and to meet the needs of growing municipalities. At the same time, some of the natural ecosystems on which municipal water systems depend are stressed. Canadians are heavy water users by international standards. 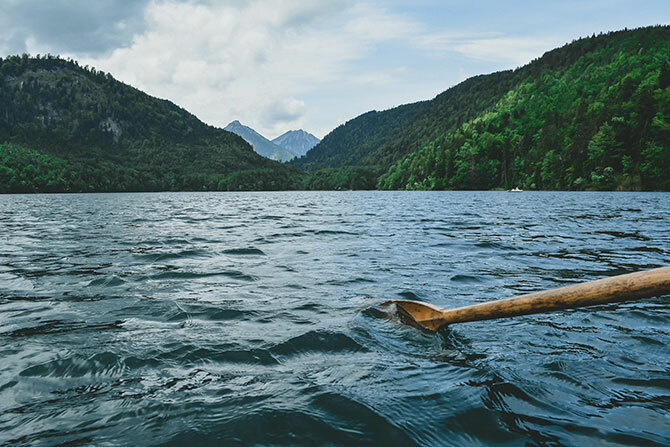 Population growth, urbanization, and low water levels during summer months pose risks to the sustainability of water supplies, intensified by the impacts from climate change. Moreover, the waste and chemicals that go down our drains can degrade natural ecosystems, despite best efforts by municipalities to use more sophisticated treatment technologies. When undertreated, this wastewater can degrade the quality of our lakes, rivers, and oceans. Well-designed user fees sit at the nexus of resolving these complex and interconnected challenges. They can both generate revenue and act as an important price signal. While user fees alone are not a silver bullet for all water-related problems, they have a key role to play. Unlike other financial or environmental policies, user fees establish a direct link between the costs of the service and the price paid by households and businesses using the water. Those who use less water, pay less; those who use more, pay more. This sends a clear pricing signal to conserve and helps reduce the long-term costs of building and maintaining the system. User fees are also more flexible than other financial instruments. They can be designed in different ways, allowing municipalities to tailor rates according to their local context, including seasonal water variations. The revenues from user fees must also—by law—go back into paying for the service. This ring-fences revenues for water utilities, which provides stable funding and helps with long-term planning. The notion of setting prices to recover the full costs of a service is intuitive; however, the prices of water and wastewater services in Canada have been set at below-cost prices for decades. As a result, water utilities have not generated enough money to make required upgrades and repairs on their systems (see figure). Although municipalities are chipping away at this gap with better longrange planning and increased investments, many still struggle with how to foot the bill. Municipalities across Canada are already leading the way forward. Our report includes five case studies, highlighting both the challenges and opportunities with implementing user fees. Each municipality has its own priorities—and face their own unique context—but in all cases, user fees can generate significant economic and environmental benefits. Based on this progress, our report provides a set of 10 best practices. They start with the fundamentals of well-designed user fees, such as installing water meters and developing strategies that define and recover the costs of service. From there, we cover the principles of well-designed user fees. A key best practice, for example, is adopting multi-rate user fees. This is when municipalities charge a basic fixed amount to households and businesses (either monthly or quarterly), in addition to a volume-based rate that varies with the level of water consumed. On one hand, the fixed amount provides revenue stability to water utilities, and helps pay for the utility’s large fixed costs (e.g., vast infrastructure networks). On the other, the volume-based component maintains a price signal for users which drives conservation. See the full report for an in-depth discussion of each case study, best practice, and the report’s six recommendations. Municipal water and wastewater systems provide an invaluable service to Canadians. How we pay for these services has clear implications for the quality of the water we drink, that quantity we use and for the health of our nation’s watersheds. Simply put, municipal water systems are too important to take for granted, even though they’re out of sight. Paying the full cost for our water and wastewater services will help ensure that Canadians—via the right amount of infrastructure—continue to benefit from clean and accessible water from their local watershed for generations to come. Jonathan Arnold is a Research Associate with Canada’s Ecofiscal Commission. His work at the Commission focuses on transportation, climate, and municipal policy. Previously he was an Economist with Environment Canada’s Regulatory Analysis and Valuation Division in Gatineau, working on industry air pollution regulations. Jonathan has a Master’s of Public Policy from Simon Fraser University. Jonathan was born and raised in Halifax, NS, and has lived in Stockholm, Ottawa and now Vancouver.